The prestigious Prince William Award for Conservation in Africa, sponsored by Investec Asset Management, was given to Richard Bonham in recognition of his lifetime contribution to wildlife and the Maasai community in Kenya. Kenya’s Mbirikani Group Ranch is one of the most beautiful places on earth: a quarter of a million acres of unfenced savannah lying between the snows of Kilimanjaro and the cloud forest summits of the Chyulu Hills. Ten thousand Maasai pastoralists live here alongside elephants, lions and other plains game, and for the past 20 years it has also been the home of one of Africa’s most highly respected conservationists. Richard Bonham was born in Kenya in 1954, the son of a well-known colonial game warden who introduced him to wildlife from the earliest age. All his school holidays were spent in the bush, and on leaving school he took up a hunting apprenticeship with the Bunny Allen, a legendary figure who had taken all kinds of celebrities on safari including the actress Ava Gardner. By then the era of big game hunting was coming to an end, and since he had already learned to fly he decided to obtain a commercial licence and embarked on an alternative career, spending the next three years as a bush pilot flying all over Kenya, Tanzania, Sudan and the Congo. By the time Kenya banned hunting in 1977 he had, in his own words, “already got the hunting bug out of me” and set up his own photographic safari company, operating in Kenya and the Selous Game Reserve in Tanzania where he pioneered the idea of reviving old-fashioned foot-safaris, disappearing into the bush for two weeks at a time with a hundred porters to carry the baggage. In 1986, having fallen in love with Mbirikani, he negotiated what was probably the first tourism land lease on community-owned land in Kenya and set about building OlDonyoWuas Safari Lodge at the foot of the Chyulus. Richard and Tara, his wife (grand-daughter of A.H. Hunter, one of Kenya’s greatest professional hunters) were married on top of a spectacular granite kopje in the plains below, and now live not far from the lodge in a wildly romantic thatched house he built in 1995. Before Richard arrived on Mbirikani the Maasai landowners were earning no revenue from the wild animals that share their land, and he quickly realised that the survival of the ecosystem and its wildlife would depend on the Maasai receiving equitable benefits from the game. The alternative was a remorseless decline into unsustainable alternative land uses that would very quickly fragment this crucial dispersal area linking four of East Africa’s finest national parks: Amboseli, Tsavo, Kilimanjaro and the Chyulu Hills. This was the vision that led Richard to create the Maasailand Preservation Trust (MPT) in 1992, following it up with Kenya’s first community game scout programme and a host of community outreach programmes supporting education, healthcare, women’s groups and environmental awareness. The results have been spectacular. The wildlife security programme that Richard started with four game scouts now employs 300, covering over two million acres of the Amboseli ecosystem, and the rate of elephant poaching in Richard’s area is probably the lowest in Kenya. The education programme has established a boarding school for 300 girls, supports eight primary schools and currently pays over $150,000 a year in school fees to 130 community members. Malaria – formerly the number one killer disease in the area – has been almost eradicated through the introduction of mosquito nets; and as part of its environmental awareness campaign the Trust has so far planted more than 200,000 trees. Perhaps the most successful initiative for resolving human-wildlife conflict has been the Predator Compensation Fund that Richard co-founded in 2003 in order to bring back the carnivores from the brink of extinction. Seven years ago the local lion population was almost wiped out. Now numbers have increased and two prides – 13 lions in all – have returned to the Mbirikani bush country and are seen regularly by guests staying at OlDonyo Lodge. Until recently it was a rite of passage for young Maasai warriors to prove their courage by spearing a lion. But with 4,000 warriors waiting to enter manhood and fewer than 200 lions in the entire Amboseli ecosystem the tradition was clearly unsustainable. To try and resolve the problem an education initiative was created in collaboration with the community’s elders to take lion killing out of the Maasai culture. The answer was the first Maasai Olympics, held in December 2012 before a crowd of 2,000, with 200 competitors taking part in traditional events such as spear throwing, high jumping and a 5,000m race. Since then, lion killing has virtually ceased, and the next Maasai Olympics are due to take place on December 13 with David Rudisha, the 800m Olympic Champion as President. Richard has always believed that the generation of economic benefits through wildlife-driven enterprise is key to wildlife’s survival in modern Africa. To this end he has worked endlessly to build an essential revenue stream for the region’s Maasai community, producing $1.1 million in 2012 from tourism conservation fees and other sources. To underline the personal sacrifice involved it is worth pointing out that from 1992 to 2010 Richard worked in conservation pro bono, taking no salary from the Trust and often investing his own resources to fill gaps in the budget. The only compensation he received from nearly 20 years of dedicated work was a donation from a supporter who undertook to cover the education of one of his three children. Today he currently receives a salary from Big Life Foundation, the organisation established by the photographer Nick Brandt in 2010, who declared: “Africa without animals is a continent stripped of its soul.” With one of the most spectacular elephant populations in Africa being rapidly diminished by poachers, the Amboseli ecosystem that straddles both Kenya and Tanzania became the Foundation’s most urgent project and Richard is now its Director. 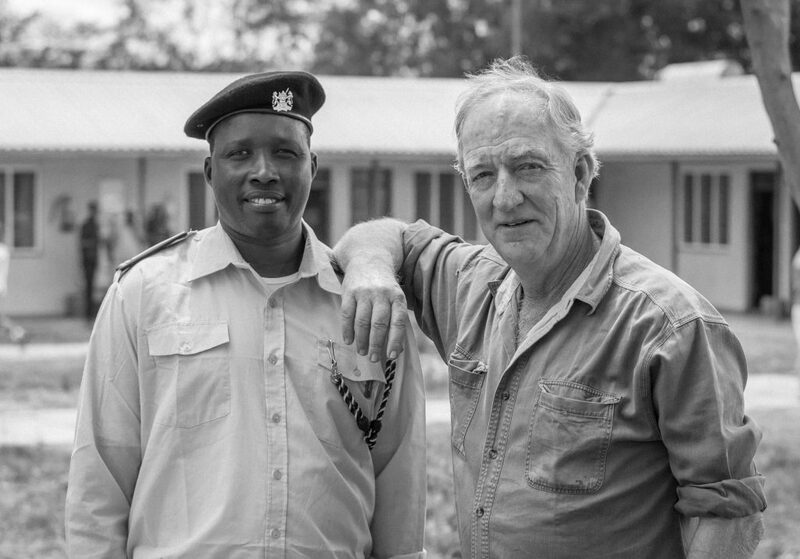 With all these achievements in mind, it is hardly surprising that Richard Bonham should today receive the Prince William Award for Conservation in Africa – a reward that pays tribute to a lifetime of outstanding dedication and exceptional contribution to conserving Africa’s wildlife and last great wild places. If you’ve been inspired by Richard’s story, learn about another finalist, or let others know about the Tusk Awards.